The Deal or No Deal Las Vegas slot machine brings to life the exciting action of traditional Deal or No Deal, with enhanced bonuses and a dual grid base game, plus the addition of two progressive jackpots for even larger winning potential. The Deal or No Deal Las Vegas slot machine is housed in the stunning MaXVusion cabinet which features immersive sounds and stunningly smooth gameplay, and unlike the community games of In It to Win It and Join N’ Play, DOND Las Vegas is a standalone game, affording you more privacy. The base game of the slot machine uses a unique two grid concept which effectively makes for two slot machines playing side by side. However, unlike two individual slots, the Deal or No Deal Las Vegas game both share the same center reel. The center reel is enhanced with wilds, free spins, gold and silver cases which are used to win the progressive jackpots, and a Bankers bonus symbol which awards mystery wilds. The middle reel slices through both base games. Aside from the mystery wilds from the Bankers bonus symbol, Deal or No Deal Las Vegas has three bonus games, each awarding various amounts of money up to the progressive jackpot. The first bonus is the well-known Briefcase bonus game which works mostly the way you would expect of the famous TV show. This version however is limited to just one round, the end of which you can either ‘deal’ or ‘no deal’. If you ‘deal’, the feature ends with credits been banked, if you ‘no deal’, you get to spin the bonus wheel where you can win cash amounts, one of two free spins bonus games, a peak inside your case or gold briefcases which go towards winning one of the two progressive jackpots. The free spins bonus on the Deal or No Deal Las Vegas slot machine features two special shared reels on reels two and four, both of which feature wild symbols and re-triggers. The shared reels cut through both slot games in the same way as the center reel does from the standard base game. The number of symbols that activated the bonus determine how many free games are awarded. Each additional trigger symbol during the bonus awards a further free game, so multiple free games can be accumulated during the bonus round. The progressive jackpot bonus is what most players will aim to achieve. There are two cashpot values, both prominently displayed above the main game on the top screen, the lowest valued one is awarded most frequently and is often $100 or less. The top progressive jackpot features values in excess of $2500 most of the time. The progressive jackpot is won by collecting eighteen Mega Deal briefcases for the Mega Deal progressive, or eight Big Deal cases for the Big Deal progressive. 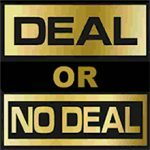 Deal or No Deal Las Vegas uses 58 winlines, with a minimum of 60 credits per game and a maximum of 180. The maximum win per game is 21,750 credits in the base game.